You've managed to squeeze all your essentials into that little purse - even a brush! Wow. Great page, too. I love the dotted paper edge. I am a little like you and have downsized my handbag. Your large photo blended into the background looks great. I like the snoopy packet of tissues. Yes, I think the younger you are the more ‘junk’ you carry. Lovely page. 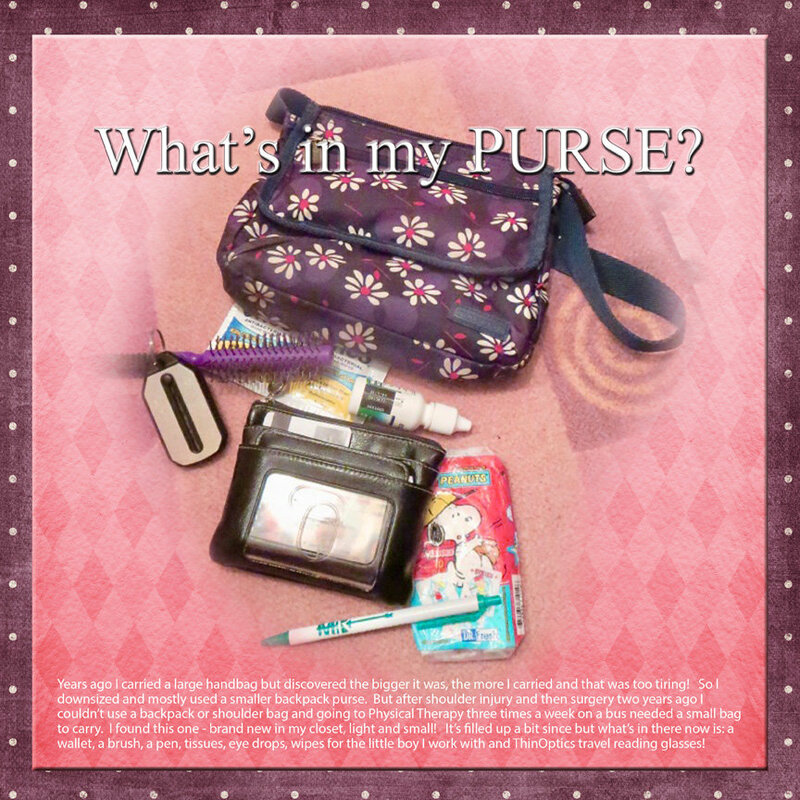 I remember my mom's purse being huge and full of so much stuff - it was always a mysterious bag that I wanted to go through! I'm the opposite, like you, I don't like carrying a lot with me. I like the purse, it's pretty! So funny that your purse got smaller over the years so did mine. I find that it is easier to find what I need in my smaller every day bag. I like your bag, so pretty! Sometimes I'd go out with just my driver's license in my pocket I got so tired of carrying a purse. Love the papers you used on this. Cute snoopy packet.